Shatnez restrictions by wool and linen strings: Although [according to the custom to follow the first opinion] both wool or linen fringes may be used for a garment of any material, [and according to all opinions, if two of the four strings are of wool and the other two of linen it may be used on any material garment] nevertheless, due to this possibly leading to a [Biblical] prohibition of Shatnez, one may not tie wool strings to a linen garment or linen strings to a wool garment [and certainly may not tie wool and linen strings in a single corner of Tzitzis]. Furthermore, due to Shatnez suspicions, one may not even tie linen fringes to a linen garment, as explained in Halacha 1A. Furthermore, it is proper to beware to not use linen strings at all as Tzitzis, even on a garment of other materials. Nevertheless, in a time of need, such as if one only has linen strings available, then it is permitted tie them onto the corners of a garment [of any material other than wool]. All materials, other than wool and linen, are only valid to be used as Tzitzis if the corners of the garment are made of that same material. For example, silk Tzitzis strings may only be tied to the corners of a silk garment; cannabis Tzitzis strings may only be tied to the corners of a cannabis garment; cotton Tzitzis strings may only be tied to the corners of a cotton garment. They may not be tied to the corners of a garment of a different material. If they are tied to the corners of a garment of a different material, the Tzitzis are invalid, and it hence remains prohibited to wear the garment. Wool fringes: Is valid for all material garments other than linen. Nevertheless it is proper for every G-d fearing Jew to be stringent upon himself to only use wool fringes on a wool garment. One who wears a non-wool garment that has wool fringes should not say a blessing on it, and rather is to hear the blessing from someone else. Linen fringes: Is not to be used for any material Tallis. In a time of need, one may use it for any material Tallis other than wool. Other materials: Is only valid for a Tallis made of its own material. If one has a cotton Tallis Katan, what material strings should be used for the Tzitzis? Every G-d fearing Jew should use only cotton strings and not wool. If wool strings were used, it is proper not to recite a blessing on this Tallis, as stated above. Thus, when purchasing a pair of cotton Tallis Katan, one should try to arrange that the strings used are made of cotton. Almost all fringes available today on the market are made of wool. If one is unable to use cotton Tzitzis for the garment, one should endeavor to wear a wool Tallis Katan. What is one to do if cotton Tzitzis strings were used for his wool Tallis? The Tallis is invalid. One may not wear the Tallis until the Tzitzis are removed and wool Tzitzis are tied to its corners. Almost all Tzitzis strings available on the market are made of wool, as the custom follows the opinion that wool exempts all garments. Many Tzitzis manufacturers will not manufacture strings made of other material due it potentially causing a stumbling back for people who will use them for a non-same material Tallis. In the event that one purchased cotton strings, they may only be used on a cotton garment, as stated above. Only sheep wool is defined as wool in the above regard [to be valid to be tied on garments of all materials, according to the custom]. The wool of a camel, goat or rabbit is not considered wool in this regard, and hence fringes made of such materials may only be tied to garments made of those same materials, just as is the law by all materials that are not wool or linen. If one ties fringes of these materials to a garment that is not of the same material, the Tallis is invalid and is forbidden to be worn. The reason: This is learned from the verse “Tzemer Upishtim Yachdav; Gedilim Taaseh Lecha”, that only when the wool and linen are together do they exempt the corners of any material Tallis. [Admur ibid] This ruling, that two strings of wool and two of linen is valid for all materials, applies also according to the first opinion above, and is an exception to the ruling in 9/8 that all strings must be made of a single material. This option was not offered by Admur in 9/6 being that practically it is forbidden due to Shatnez. Three of wool and one of linen or vice versa: Tzaruch Iyun if having 3 strings of wool and one of linen, or vice versa, is also valid according to this opinion or perhaps it is invalid due to the ruling in 9/7, and hence cannot be used on any garment due to a Biblical question. Two sets of wool and two sets of linen: The above seemingly refers to tying two strings of wool and two strings of linen in each set, as was done in the times opf Techeiles. However not to having two whole corners of only wool and the other two corners of only linen. Vetzaruch Iyun according to this opinion as to the status of a Tallis that has two sets of corners of wool and two sets of corners of linen. Other opinions: Some Poskim rule it is better to attach wool strings to a silk garment. [Beir Heiytiv 9/1 in his understanding of M”A 9/4] Admur in Kuntrus Achron 9/2 negates his understanding of the M”A. Is one to say the blessing if he does not have another Tallis available? Tzaruch Iyun if according to Admur even in such a case one should not say a blessing, or only when he in any event has another Tallis available is he not to say a blessing. Other opinions: See Beir Heiytiv 9/1 brought in previous footnote which implies a blessing is recited on a silk Tallis with wool Tzitzis! Pashut, as we do not apply the rule of Safek Brachos Lihakel against a Minhag, and the custom is like the first opinion, as stated above in Rama and Admur ibid; Likewise, Admur only writes that it is proper not to say a blessing, and does not prohibit doing so. Igros Kodesh 11/23 [printed in Shulchan Menachem 1/45]; Seemingly this means that if one comes to wear the Tallis at night, or to wear Kesus Layla, then he Biblically transgresses Shatnez, and for this reason the Sages made a Rabbinical decree against doing so. 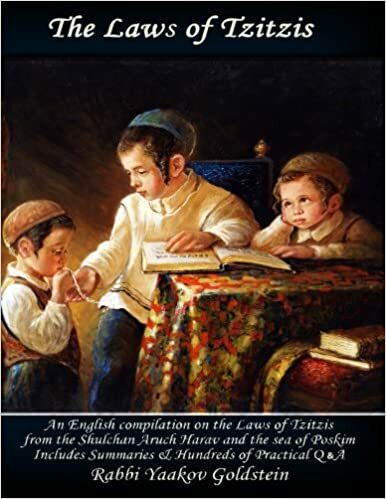 9/2 allows placing it on a linen garment in time of need, and certainly one may place it on other materials, however one may not tie it to a wool garment even in a time of need, as doing so remains Rabbinically forbidden even today.